The 25th Annual Factoring Conference will be held at the Manchester Hyatt in San Diego, CA! 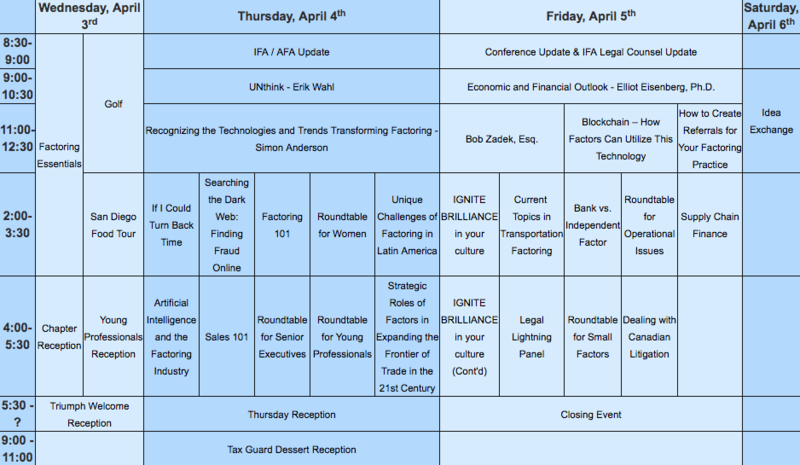 The event is hosted by the International Factoring Association and features industry information from accredited speakers, expert panels and roundtable events, networking opportunities and evening receptions. Not great at networking? Not feeling super confident in converting new leads into business relationships? Brush up on your trade show skills with these tips and tricks for Invoice Factoring Companies. Registration fees for IFA members are $1045 for the first attendee and $995 for additional attendees. Non-members are welcome and will be charged an additional $100 per attendee. Extra fees apply for the Golf Tournament and tours. CPE, CLE and CAEF Credit offered. For more information or to register visit www.factoringconference.com or call 805-773-0011.